See you in Phuket! And if you need a hotel look here! Everyone says it these days ... "funny weather" .. "The weather wasn't like this when I was young" .. extreme weather seems more common, I am not sure if that is true or we just hear about it more due to ease of communication, internet, TV, blogs, Facebook, Twitter .. and we see more pictures and videos because these days everyone has a camera or smartphone and pictures can be taken by anyone and sent round the world. But it does still seem there are more floods, droughts, bush fires, typhoons, hurricanes, storms, freak weather ... the Typhoon that hit the Philippines 2 weeks ago, Typhoon Haiyan, or Yolanda as they called it there .. terrible. Huge loss of life. And it seems like there have been non stop storms hitting the Philippines this year. These Typhoons head in from the Pacific and sometimes turn north towards Japan, sometimes head west into SE Asia. The Philippines often gets the worst of it, or the coast of Vietnam. 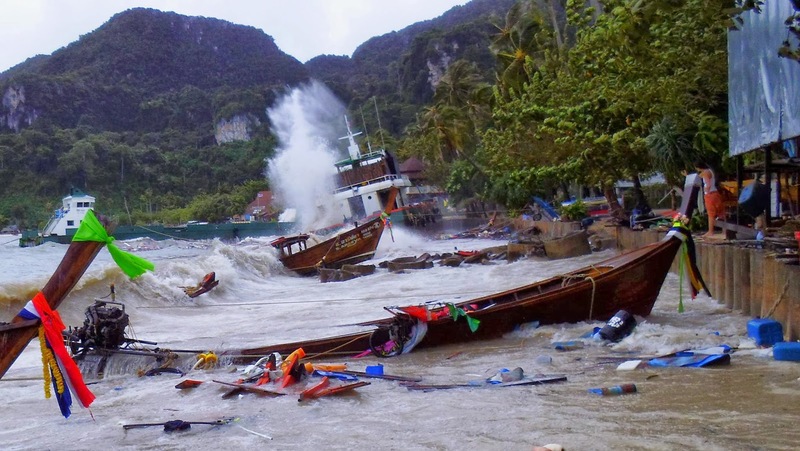 When the storms hit the coast they dissipate, though sometimes bring extra rainfall to parts of Thailand, Cambodia and Laos. Only one time in recent history has a Typhoon strength storm hit Thailand - this was Typhoon Gay in 1989 which hit my wife's hometown of Chumphon on the east coast and killed hundreds of people. Here in Phuket we don't get really bad weather. I mean, sure, as a tourist you might be annoyed by rain, and there may be some days during the year, almost always in low season (May - October), when the weather is too bad to do anything, trips cancelled, ferries not running, but it's rarely that bad and there are plenty of things to do on a rainy day in Phuket. So the events of Saturday were a bit of a surprise! We had a fairly big storm with winds from the east and quite a lot of damage caused, though it would seem no loss of life. 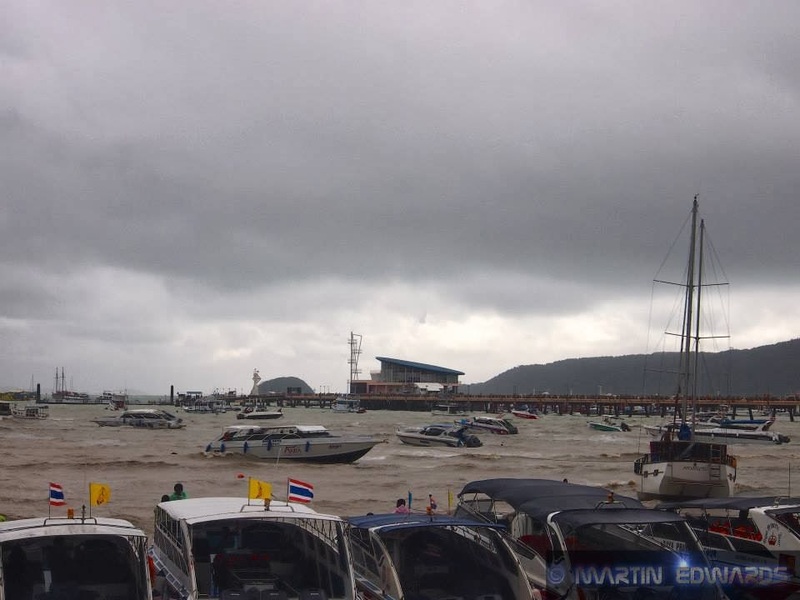 So I just updated the weather blog on November 19th and the weather in Phuket was normal for November. Sun, some thunderstorms, a bit of grey weather, lots of tourists, all dive trips running smoothly. On November 20th, it was a bit grey .. I Tweeted "Grey start to the day. Lots of cloud and no sign of morning sunshine." and on the 21st "morning weather report ... it's grey and a bit damp. Not raining exactly, but plenty of dark clouds around. Certainly not sunny." .... The forecast on Windguru showed clearly that some really sudden windy weather was to be expected, but every time I looked at the forecast the arrival of this windy weather was getting later. SOme dive trips cancelled on Friday due to the forecast, but actually Friday 22nd was OK .. a bit wet, but the sea was not rough. And then yesterday (Saturday 23rd). 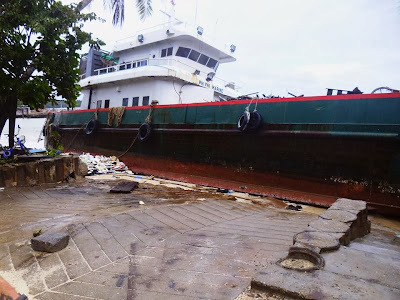 I was home most of the day and although it was a bit wet and quite windy, our house is in the center of the island and I had no idea that there was so much damage until a friend who works at Cape Panwa Hotel posted a video on Facebook of a boat hitting and damaging the hotel jetty. Below - a bunch of photos stolen from various sources, none of them mine, Credits given. 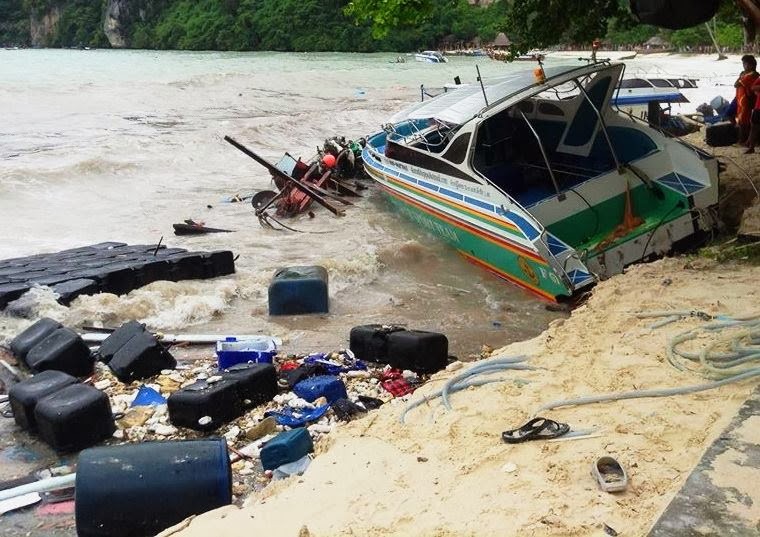 Seems that Tonsai Bay in Phi Phi was hit hard - several boats sunk and lots of smashed up longtails and speedboats. The Phuket News had a report online about damage in Phuket. (above) This was at Ao Yon bay in the Cape Panwa area of Phuket. 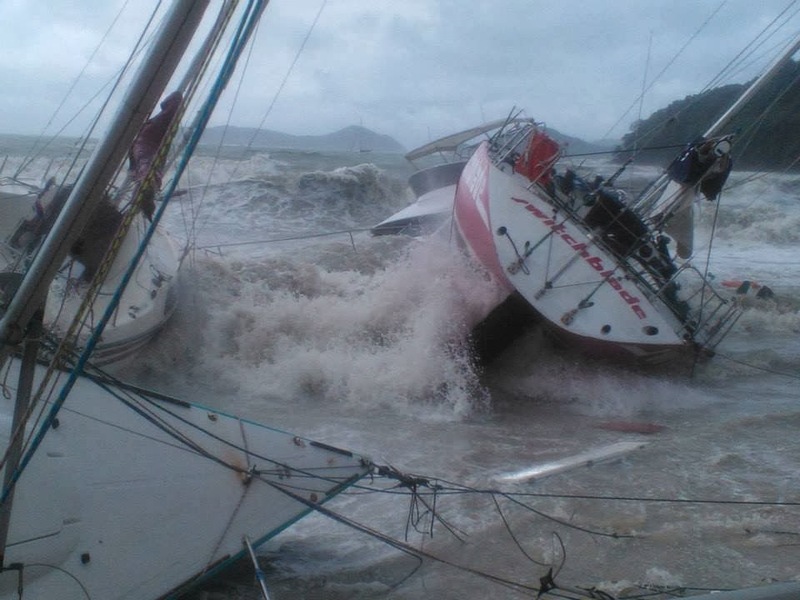 Several yachts were beached or seriously damaged. The big Kings Cup sailing event is due to start soon. 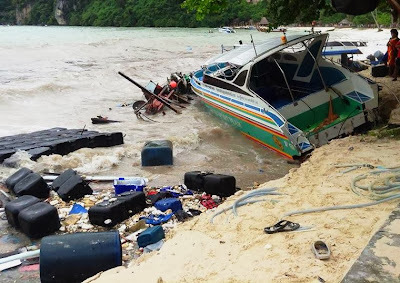 Even in Chalong Bay, in the south of Phuket, which is the most sheltered bay on the island, used by all kind of boats, the waves were big enough to cause damage. 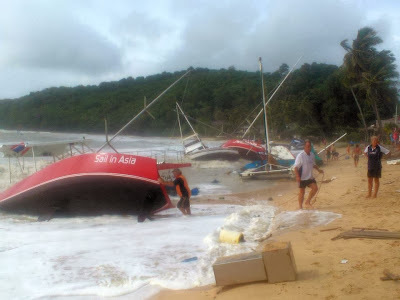 The Phuket News reported "two boats close to shore were torn from their moorings and beached. 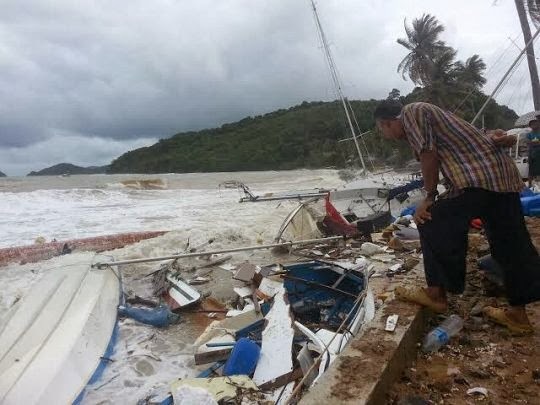 Out in the bay, large waves caused boats to smash together"
More reports about the storm on the Phuket Gazette website here, here, and here. Although looking the other way, there were clouds over the hills and there was a bit of rain during the morning, but the afternoon was nice and sunny. The winds have gone, the storm was just a freak half-day occurrence. The very very end of the low season, a final hurrah .. I can see the forecast on Windguru for the next week - the winds starts to blow from the northeast. And the real high season starts. And if you need a hotel, have a look at Agoda. If you book there, it makes me some beer money and helps the blogs to keep running!